In 2017, its tenth anniversary year, NetIKX is running a series of meetings with speakers who have spoken to us before. In March we invited David Gurteen to speak around the topic of ‘entrained and entrenched thinking’, and other constraints on knowledge sharing – and, what we can do about it. Specifically we wanted him to run one of his Knowledge Café events for us, in part because that process incorporates features designed to widen the scope of conversation and the consideration of diverse points of view. As usual, these notes are constructed from my personal perspective. ‘Entrenched’ thinking is something we pretty much understand. It’s when people refuse to consider the validity of any idea but their own, and it is often encountered in groups that see themselves as actively in opposition to another group. They are ‘dug in’ and refuse to budge. We’ve seen a lot of that in politics in the last year, but it occurs in all sorts of social and business environments too. The phrase ‘entrained thinking’ is less familiar. It may have been coined by Dave Snowden and Mary Boone in their article in Harvard Business Review in 2007, where they define it as ‘a conditioned response that occurs when people are blinded to new ways of thinking by the perspectives they acquired through past experience, training, and success’. They note that both leaders and experts can fall into entrained thinking habits, which cause them to ignore both insights from alternative perspectives and those offered by people whose opinions they have come to disregard as irrelevant. Evolutionary biology suggests reasons why falling back on available quick-and-dirty patterns of thinking (heuristics) has survival advantages over thinking everything through carefully from every conceivable angle; as Dave Snowden says, when you come across a lion in savannah country, it’s best not to analyse the situation too thoroughly before legging it up a tree. In his book Administrative Behavior (1947), Herbert Simon referred to such just-good-enough thinking as satisficing, and a study of the nature and role of heuristics in decision making was also central to Amos Tversky’s and Daniel Kahneman’s argument in Judgement Under Uncertainty: Heuristics and Biases (1982), which also introduced the concept of cognitive bias – a concept to which David Gurteen made reference. In this seminar and Knowledge Café workshop, David Gurteen focused on those blockages to ideas production and sharing that can occur in meetings and group conversations, and the actual practice of his Café technique shows some ways this can be done. So let’s get to understand the Café process, then move on to how David introduced our session, and close with a brief report of what came up in the closing in-the-round plenary session. David’s Knowledge Café process is a version of the World Café technique first devised in the mid 1990s by Dr Juanita Brown and David M Isaacs, an American couple who work with organisations to unleash ‘collective intelligence’ through ‘conversations that matter’. (See http://www.theworldcafe.com/) These techniques have been used by industrial companies, such as Hewlett-Packard and Aramco, and by local governments and non-profits in the context of social and economic development and community relations. David has also run such sessions professionally for organisations across Europe, Asia and the Americas. They seem to work well in a wide range of cultural settings – even, he said, in those Asian cultures in which people often defer to authority. In a small group, it is easier to speak up about what you think, though as an organiser of such an event you may need to ensure that the groups are made up of equals. The essence of the Café technique is to enable discussion around an open-ended question. Participants are divided into groups of three, four or at most five people, sat around tables (note: this is smaller than the typical size of a table group at a NetIKX workshop). In David’s events, the starting question is framed by having a speaker make a very short initial presentation of the topic – typically ending with the posing of such a question. 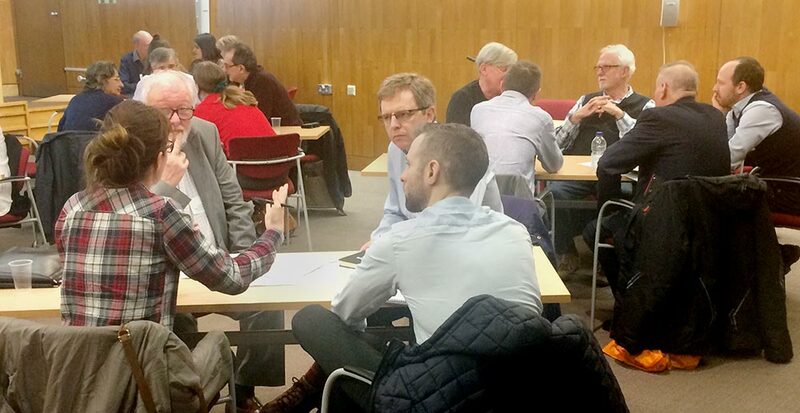 After the discussion around tables has gone on for some time, generally 15 minutes, the facilitator asks the table groupings to break up and re-form – for example, two people might stay on the same table while two move off to join other tables. After another 15 minutes’ conversation, the table groups are once again re-organised for a third round. David never uses more than three rounds of conversation in his own practice. The general aim of such Café techniques is to help people to accumulate a cascade of perspectives, and to widen their thinking. There are variations on this theme. One World Café practice is to put a large sheet of paper on each table and encourage people to jot down ideas or doodle pictures during their conversations, so that the next group gets a sense of what has gone before. Another version appoints a ‘table host’ who stays with the table, relays ideas from the previous round, and encourages the new group to add ideas and perspectives to what has gone before. Such a person might also act as a rapporteur in a closing plenary session. David’s practice dispenses with table-level facilitators (and doodle pads and rapporteurs), which makes a Gurteen Café easier to organise. The accumulation of perspectives tends to happen anyway, as people tend to share, with their new group, the ideas that came up in the previous one. In David’s version of the Café, he said, there is no reporting back. The café’s outcomes are about what each individual takes away in his or her head – and that will be different for each person. As Theodore Zeldin says, the best conversations are those from which you emerge as a slightly different person. However, David later qualified that by mentioning circumstances in which gathering and reporting the ideas that surface can be very valuable as a contribution to a problem-solving process – for a company or project, for example. His own general events tend to end these days with a closing session bringing everyone together in a circle for freeform sharing of ideas ‘in the round’ – space permitting. We did this at the NetIKX Café. David explained a few guiding principles. The Café is about dialogue, not debate – it’s not about winning arguments, but nor is it about seeking consensus. The idea is simply to bring ideas and issues to the surface. And it is OK to drift off-topic. Asked whether it is different to run a Café session inside a particular organisation, David responded that he’s found that the format can be used for brainstorming or as an adjunct to problem-solving; in that case, one should start in advance by defining the objective, and design the process accordingly. For such gatherings, you probably do want to include a method for capturing the ideas that arise. But any such capture mechanism must not get in the way of the conversation – giving one person a flipchart and a pen will put them in charge and distort the free exchange of ideas. David explained that in his short pre-Café presentation he would touch on some challenges that we need to overcome in order to make better decisions, and to be more creative in coming up with ideas. In the café process we would then discuss how we might mitigate against these challenges. Cognitive bias. David recommended that we take a look at the Wikipedia article about ‘Cognitive bias’. That in turn links to a page ‘List of cognitive biases’ — something like 200 of them, although it has been argued they can be grouped into four broader categories, arising either from too much information, not enough meaning, the need to act/decide quickly, and limits of memory. One of the ideas that has made it into common parlance recently is ‘confirmation bias’ – we tend to pay heed to ideas that reinforce our existing views. Entrained thinking. This seems to be a relatively new idea, put forward by Dave Snowden and Mary Boone as described above. The idea is that we are conditioned towards certain ways of thinking, and it can be because of our education and training. We are also influenced by our culture, the environment in which we have grown up, and our experiences. These influences are so subtle and ingrained that we are probably not aware of them. David asked me (Conrad) if I see things the same way. I replied that I do – but that although ‘entrained thinking’ appears to be a new term, it isn’t really a new idea. When I was studying the History of Science at Glasgow University, an influential book was Thomas Kuhn’s The Structure of Scientific Revolutions (1962) – the book that introduced the phrase ‘paradigm shift’ to the English language. Kuhn argued that scientific progress was not, as generally assumed, a matter of development by accumulation of facts and theories, but more episodic, involving the overthrow of previously prevailing ways of seeing the world. And until the new paradigm prevails, the old one will have its deeply entrained defenders. One example that Kuhn analysed at length was ‘the Copernican revolution’, which argued that the earth orbits the sun, rather than the other way around. Darwin’s theory of evolution also met with strong opposition from people invested in a creationist narrative and Biblical timescale for earth’s existence, and more recently the theory of plate tectonics and continental drift was resisted and mocked until the 1960s – yet it is now one of the ground truths of geological science. So Kuhn’s idea of a ‘paradigm’ – as a way of thinking that one considers normal and natural (but may later be replaced by a better one) – does carry in it a notion similar to ‘entrained thinking’. Entrenched opinions. People may be resistant to taking new ideas on board – they take an entrenched position. Such people are not prepared to listen; they ‘know they are right’ and refuse to consider an alternative interpretation. In this case people may be very conscious of their views, which are closely bound up with their sense of themselves. ‘Speaking truth to power’ is a phrase that we hear a lot – it could mean not being afraid to say something to your boss, even though the consequences for you could be dire. The phrase recognises that power relations influence whether we choose to express our thoughts and views openly. Loss of face. If you’ve always got to look good, it’s very difficult to speak up. A related critique of social media – Facebook, for example – is that it encourages people to live in bubbles of confirmation bias, connecting us to people who share the same ideas as ourselves. Groupthink is a well known term. Perhaps people in a meeting do all think the same way – or is there a sizeable group who think differently and just don’t want to rock the boat? Last on David’s list was facilitator bias – was he, for example, in a position to bias our thinking? So here were a few barriers that can get in the way of a good conversation, and thus impoverish group creativity and problem solving. David invited us to go into Café mode and talk about how to overcome these problems. In the promotional text for this meeting, we had asked three questions, and David suggested that perhaps each ‘round’ of the Café might look at these. The first question is, what factors in people’s backgrounds, professional education and culture, lead to them having a ‘blinkered’ view of the range of available opinions and policy decisions, especially at work? How might this be mitigated? Second, when we meet together in groups to decide something in common, to come to a practical decision, what meeting dynamics are getting in the way of us accessing the broadest possible range of opinions and inputs? Could we be running those meetings differently and getting better results? Finally, what are those two questions forgetting to consider? After three rounds of ‘Café table talk’, we rolled the tables out to the edges of the room and created a circle of chairs (there were about forty of us), and continued the conversation in that mode for about 25 minutes. I’m not going to report this blow by blow, but highlight some ideas put forward, as well as comment on the process. It’s worth pointing out that the dynamics of discussion in the larger group were (as one might expect) very different from in the small groups. Some people said a lot, while about half said nothing at all. For the first nine minutes, about ten people spoke, and all were men. There was a tendency for one person to make a point that was reacted to by another person and then another and so on, in a ‘chain reaction’, even if that meant we drifted off topic. For about five minutes, the tone across the room got quite adversarial. So while the technique of making a big circle does help to gather in what had been thought across the table groups in a Knowledge Café, it can have its demerits or perils. Meeting management methods. Steve Dale mentioned that at the LGA’s Improvement and Development Agency, there was a manager who used to take his team out on a walk – about ten people – and they talked as they walked. People wondered how practical that was! David Penfold suggested that if they walked and talked in groups of three, then they could stop at the pub and have the whole-group session – a Knowledge Café on legs! Steve also pointed out that in some meetings – with fixed time and a business agenda – a free-flowing conversation would waste time and get in the way. Various people noted that one could loosen up thinking with a Café-style session or brainstorming, and follow that with a decision-making meeting – preferably after a fallow period for reflection. Someone outlined a method she finds useful for eliciting a wide range of contributions. Pose an issue and get people to reflect on it individually for a while, in silence; then ‘pair and share’ with one other, to practise articulating your own ideas and also listening to others. Then you can progress to groups of four; then feed back from the groups to the whole assembly. When you are divided into small groups, we noted, the dominant types can only dominate a small group! Dominance in group situations. Gender dominance or imbalance can affect the dynamic in discussions; so could dominance by age or ethnicity. Clare Parry spoke of occasions when someone from a minority makes a point and it is ignored; then someone from the majority says it, and suddenly it is a fantastic idea. These biases might be subconscious; but a younger person thought that discounting the opinions of younger people could actually be a quite conscious bias, based on the opinion that older people are more likely to know what they are talking about. Bad paradigm shifts and entrainment. I (Conrad) thought it would be a mistake to think that paradigms always shift in the right direction! An example might be an assumption that information management is something that computer people do… We debated for a while whether this assumption was as widespread as 20 years ago: opinion differed. Dion Lindsay, in his work around both information and knowledge management, finds that information professionals make a huge assumption that they are the best people to lead an organisation’s efforts in knowledge management. They see a continuum between librarianship, information management and knowledge management – which is not how the rest of the organisation sees things. And that, he said, is an example of entrained thinking (on both sides, perhaps). Unfortunately, but predictably for this NetIKX crowd, this issue of IM and KM and IT set off a long series of exchanges about the rights and wrongs of managing information in a technology environment, which strayed right off the point – and got quite heated! Influencing culture from the top down. One table conversation speculated that if a bunch of people at board level have got stuck in a rut with a particular way of doing things, it could be mitigated by bringing in someone with different thinking – like a football team appointing a maverick football manager to shake things up. On the other hand, this could backfire if ‘the old guard’ react by resisting and subverting the ‘outsider’. An open, learning culture. Stuart Ward argued that organisational culture can be a positive influence on how decisions are made – if the people at the top visibly promote diverse thinking by asking people for inputs and opinions. Nor should people be penalised for making mistakes, if the result is learning that can be shared to improve future results. We came to no shared and agreed conclusions – but that’s not what a Knowledge Café does. Everyone took something different away in their heads. Wow, Conrad, this is very valuable report on the seminar. Can I ask a question about entrenched and entrained thinking – Are they really different things? Entrained thinking seems to be a subset of the general case of entrenched thinking. Do they need to be treated differently? Lissi asks is ‘entrained’ thinking is the same as or a subset of ‘entrenched’ thinking. It you examining their effects on communication or debate, they may appear the same; but I believe if you are looking at causes, and what to do about it, the differential analysis is useful. Entrenchment may be an attitudinal problem; entrainment is a problem of habits of thinking.